Recently I left Tiny Trees Preschool after four years as the founding Chief Executive Officer. As an ally, who helped build this school I wanted to reflect on what we have accomplished together. Tiny Trees started as a dream – to bring affordable, high quality preschool to families across Puget Sound. My strategy was to use outdoor classrooms to lower the cost of starting and operating preschools, and in doing so provide children from all walks of life a joyful childhood immersed in the natural world. It spoke to my commitment to access for all people to quality education, and my personal passion for exploring and playing in Washington’s wild spaces. After years as a teacher, leading wilderness expeditions across the globe for Outward Bound, NOLS, and the YMCA, I saw a need to help children develop a lifelong connection to the natural world. Especially in a world of increasing digital distractions. The outdoor preschool model that had taken off in Europe (where they are known as Forest Schools) provides a deep, sustained connection to the natural world during a child’s most formative years. It was, and remains, one of the most effective ways to integrate outdoor play and exploration into a child’s daily life. The outdoors, however, is not a comfortable place for all people. For many adults it can feel foreign, even scary. This is why the Tiny Trees story I told is one about affordability, about giving every child a fair shot at a bright future regardless of income, culture, or creed. A story that highlights how Tiny Trees offers a high-quality, evidence-based education that prepares children for kindergarten first, and the benefits of an outdoor childhood second. It provides a bridge for families who want a hopeful future for their child but would not normally seek out an outdoor preschool. It also creates vibrant, diverse classrooms, where children build friendships and learn how to communicate and empathize across difference. From the start, the idea of Tiny Trees was wildly popular. In 2014 the idea won Social Venture Partners Fast Pitch competition. In 2015 it won Sustainable Seattle’s Leadership Award and the idea was highlighted in this interview on KUOW. In 2016 we opened, receiving over 1,200 applications for only 160 spots. This article from the Seattle Times captures the magic of our first month of school, and this video (filmed during the wettest winter on record by Andrew Quinn and the Riverbend Fund) best shows what a Tiny Trees education looks like. Tiny Trees has become the largest outdoor preschool in the United States. Under my leadership we opened 10 outdoor classrooms across King County, with 270 children attending daily, and 35 staff. This September additional schools will open, helping hundreds more children access a high-quality education. 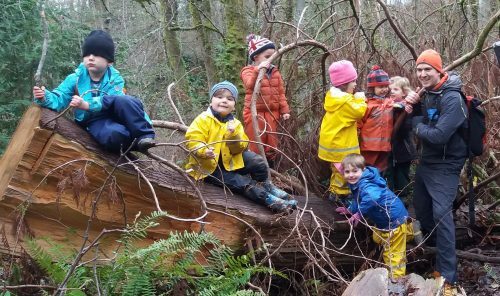 To support this work, Tiny Trees helped pass legislation to create health &amp; safety rules for outdoor preschool in Washington State. In addition to improving safety, these rules will also allow outdoor preschools to offer the full day classes needed for working families. This legislation is the first in the country, and if successful will hopefully be replicated by other states. When I started Tiny Trees my goal was to create an outdoor preschool model that could grow to help high need communities across the country. In my previous job as the National Director of YMCA BOLD & GOLD I had the honor of taking a proven, mixed income, outdoor education model that I started here in Seattle (BOLD & GOLD – Boys & Girls Outdoor Leadership Development) and replicating it at YMCAs across the country. Today YMCAs in over a dozen states offer BOLD & GOLD programs, helping thousands of young people learn leadership, communication, and empathy on 8 to 22-day long wilderness expeditions. I built the Tiny Trees model with the lessons from my experience replicating a youth program at a national scale. By design the low-capital startup costs and the sustainable financial model makes Tiny Trees easy to replicate. But the national expansion work I planned remains undone. I hope allies will step up to help the organization grow outside of Puget Sound when it is ready. I built Tiny Trees from scratch, just like I built YMCA BOLD &amp; GOLD before that. I can see from my patterns of success that I am a builder. I help organizations rapidly grow. I help good ideas tell the story they deserve. I help replicate proven models to impact exponentially more people. As Tiny Trees transitions to a mature, large organization this is a natural time for me to transition. Plus, Charlie, Tiny Trees’ founder, is entering kindergarten now. What’s next? I am taking some time to think about the next big thing. I am looking forward to spending this sabbatical hiking with my toddler in the mountains, climbing, and spending time with friends and family. Please stay in touch. You can reach me at andrew@andrewjay.org or via LinkedIN. Tiny Trees remains a powerful movement for good in the world and deserves your continued support. Since the first time I shared the idea it quickly became bigger then me. I particularly want to thank our founding teachers and staff and our pioneering families. And a big thank you to all our partners at the City of Seattle, King County, WA State and leaders like you. Lastly, I want to honor Ted Weiler. Ted was my coach and mentor during Social Venture Partners Fast Pitch competition in 2014. He helped me craft the Tiny Trees story. He helped me build the brand. And he mentored me through the start up process. His support, enthusiasm, and advice gave me the courage to pursue Tiny Trees full time (and unpaid). Ted passed away in 2015. During his lifetime he helped dozens of companies start up and coached many Fast Pitch winners. You can read more about his story here. He never got to see what Tiny Trees became, but I am sure he would be proud. Transitions are a time to pause, reflect, and move forward. In this reflective space I am filled with gratitude for all the people that joined this cause – it is a rare pleasure to lead an organization that inspires and attracts so many passionate change makers. It has been a pleasure to serve with you.